Take our 17-Question Quiz to test your knowledge of the U.S. Constitution. 2. Which one of the following did the U.S. Constitution replace? 3. Which of the following sets of words begin the U.S. Constitution? 4. Who was the president of the Constitutional Convention? 5. 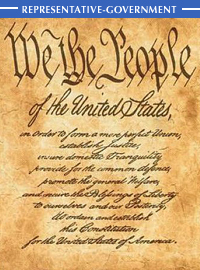 Which one of the following states was the first to ratify the U.S. Constitution, on December 7, 1787? 6. Which one of the following states, the ninth to ratify, claims the honor of putting the Constitution into effect on June 21, 1788? 7. Which one of the following states sent not a single delegate to the Constitutional Convention? 8. Which of the following pairs of Founding Fathers signed the Declaration of Independence, the Articles of Confederation and the U.S. Constitution? 9. The signers of the U.S. Constitution included two future Presidents. Who were they? 10. The first 10 Amendments to the U.S. Constitution are known collectively as which of the following? 11. Which one of the following individuals was known as the “Sage of the Constitutional Convention”? 12. Adoption of “The Connecticut Compromise” resolved which of the following issues of concern to the Convention delegates? 13. What is a Bill of Attainder? 14. How many Amendments to the U.S. Constitution have been repealed? 15. Which Amendment to the U.S. Constitution preserves the free exercise of religion, freedom of speech and the freedom to assemble and petition the Government for a redress of grievances? 16. The 27th Amendment to the U.S. Constitution – which relates to Congressional compensation and was first proposed in 1789 – was finally ratified in which one of the following years? 17. Congress is required to call a Constitutional Convention when how many state legislatures formally request that one be held?